DriveDx is the most advanced SSD & HDD diagnostic and monitoring utility! 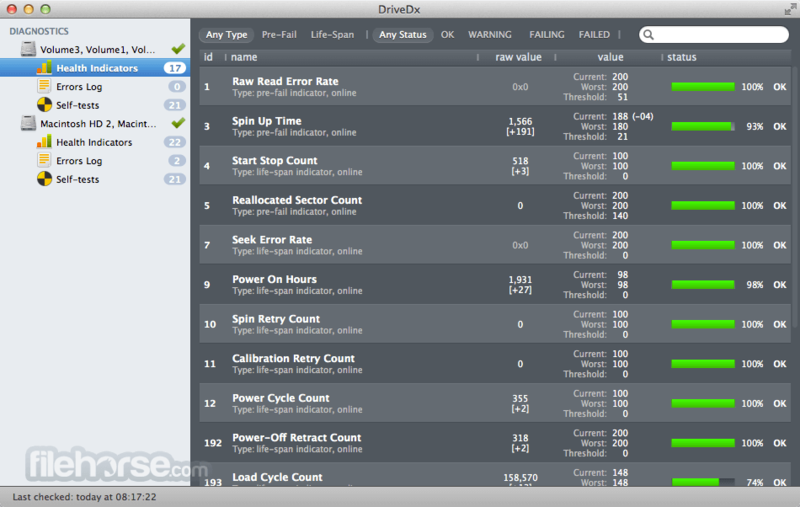 DriveDx for Mac is an advanced drive-health diagnostic and monitoring utility. Save yourself from data loss and downtime that is associated with unexpected drive failures. Don't worry about losing your important data, music, and photographs. Unlike most drive utilities, DriveDx not only monitors the drive’s built-in S.M.A.R.T. status, but also analyzes the changes of all drive health indicators that are closely related to SSD or HDD failures (like SSD wear out / endurance, reallocated bad sectors, offline bad sectors, pending sectors, I/O errors, and more) and alerts the user immediately if anything goes wrong. Our drive-health diagnostic algorithms are based on recent research in the field. The application provides access to all sufficient drive-diagnostic data to satisfy any system administrator. DriveDx is the first utility of its kind to have a real user-friendly, Mac-style interface. When evaluating the state of various drives, DriveDx for Mac can use different (specialized) heuristic algorithms, depending on the drive model and even its firmware version. One of the key advantages of the software is that the state of HDD and SSD drives is assessed using different algorithms (DriveDx has separate sets of rules and algorithms for HDD and SSD drives), since many state indicators of HDD drives are not applicable or make no sense in the case of an SSD drive. Regular diagnostic tools simply check the built-in S.M.A.R.T. status of the drive, which provides the user with little information about the actual state of the physical drive. As opposed to such tools, DriveDx analyzes the current state of the drive using all the drive health indicators that are most likely to point to a potential drive issue (for instance, SSD wear out / write endurance, I/O errors, pending sectors, reallocated bad sectors, etc). Unlike most other tools, DriveDx detects not only “OK/Verified” and “Failed” drive health states, but also the “Failing (Pre-fail)” drive state. Thanks to that, you will detect problems much earlier than when using any other SMART monitoring utilities. This means that you have more chances to save your critical data before any data loss actually occurs. DriveDx runs in the background and periodically performs checks to determine the health of your SSD or HDD. When any issue or problem is found, it alerts you immediately. DriveDx acts as an “early warning system” for pending drive problems. As a result, you have more chances to save your critical data before any data loss actually occurs. DriveDx features a special multi-tier warning system that will inform the user about deviations from the normal state of drive attributes. It constantly monitors each S.M.A.R.T. attribute (and its change dynamics) and starts continuously warning the user as the drive degrades. On the initial stages of drive degradation, the user will receive notifications of the Warning type, then Failing (means that this drive parameter is in a pre-failure state) and only then Failed. 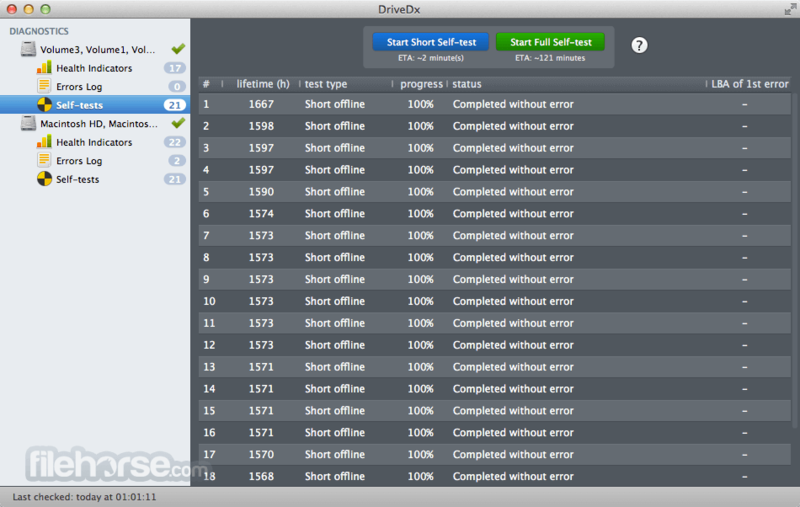 DriveDx allows you to start and control diagnostic self-tests of SSD / HDD. The primary goal is to quickly identify if the drive is faulty. Usually self-tests consist of a collection of test routines like electrical and/or mechanical performance tests as well as the read performance test of the drive. Depending on self-test type it does read scan of a small area or the entire media. When evaluating the state of various drives, DriveDx can use different heuristic algorithms depending on the drive model and even its firmware version. One of the key advantages of the software is that the state of HDD and SSD drives is assessed using different algorithms, since many state indicators of HDD drives are not applicable or make no sense for SSD drives. 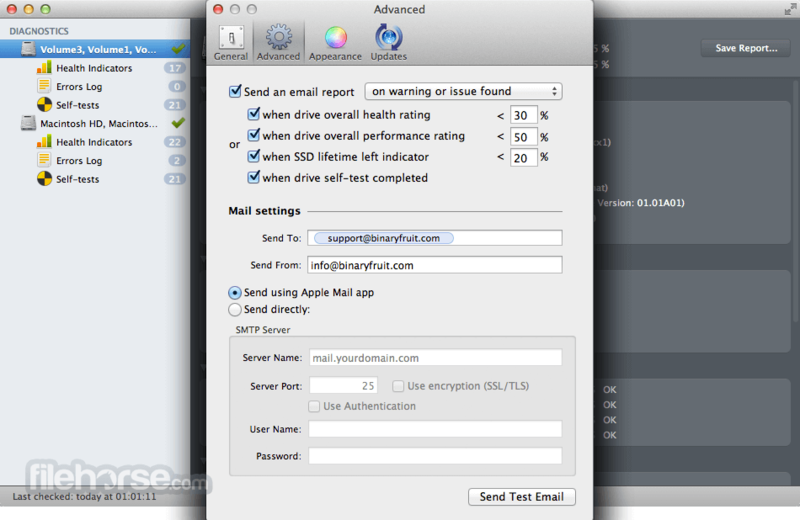 The user can get problem notifications and drive status reports to email. Reporting can be configured on the basis of various criteria. Thanks to this feature, the user does not need to have physical access to a specific computer all the time, which is especially useful for all kinds of server rooms, data centers, etc. DriveDx for Mac is one of the first drive diagnostic tools created in the true Mac style. All interface elements are clear and intuitive, so it will only take you a few minutes to learn the basics and start using the program. When a problem is identified, you will see a notification on the desktop and the status bar will show the status of your drives. Mac OS X and applications might fail due to an inability to allocate storage space. In addition, low disk space might cause disk fragmentation. To avoid data loss and to ensure the continuous functioning of your computer it is important to monitor the amount of available storage space on your drive. DriveDx can automatically monitor free disk space and will alert user immediately if user defined free space threshold exceeded. Note: 10 days trial version, 2 hour session time limit.